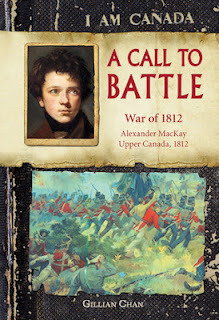 Description: The War of 1812 comes to life through the eyes of a young Canadian boy. It's 1812. War has begun, and thirteen-year-old Alexander (Sandy) MacKay is jealous when his older brother Angus goes off with their father to fight the Americans attacking the Niagara region. Too young to know the darker side of battle, he resents being left to shoulder the work on his family's farm. Itching to get in on the action, he sneaks away from home and heads to Lundy's Lane to join up with the local militia. But battle is imminent, and now there's not much his father can do except try to shield him from the worst of the fighting. Sandy's idealized notions of what battle will be like are shattered when the man standing before him is killed by a musket ball and Sandy's own brother is severely wounded. At the battle of Lundy's Lane, the united Canadian/British forces turn the tide against the American troops, but Sandy comes to know how chilling war can be. He looked upward. "Is it always going to be the province of the young to be so foolhardy and brave." "Abell was one of our enemies, enemies I hated with my heart. Yet he was just a boy like me. I shuddered when I thought that. I could see so many similarities between us. I sank down again and rested my back against the tree, unsure what to do next." "I could not stop the tears that came then. I bawled like a baby, not caring if my howling drew the enemy to me. I cried for Abell and his Abigail. I cried for myself. I cried for Angus and Father. I cried for shattered dreams of glory and adventure that had ended with a bloody, broken boy in a wood. I cried for oblivion and was granted it, for I fell into the arms of exhaustion and slept."